A valuable bicycle planning and policymaking tool? 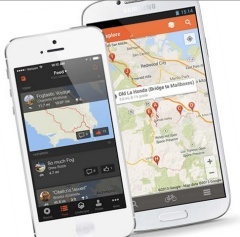 The Oregon Department of Transportation (ODOT) is the first state transportation agency in the United States to ink a deal with Strava, a leading website and smartphone app used by people to track their bike rides via GPS. Last fall, the agency paid $20,000 for one-year license of a dataset that includes the activities of about 17,700 riders and 400,000 individual bicycle trips totaling 5 million BMT (bicycle miles traveled) logged on Strava in 2013. The Strava bike “traces” are mapped to OpenStreetMap. If all goes according to plan, the data could revolutionize how ODOT makes decisions about their policies, plans, and projects. 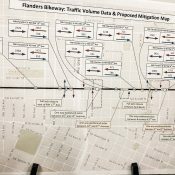 At the very least, forging boldly into the realm of “big data” and pushing the boundaries of bicycle planning marks an important step for an agency that’s facing a very different future and actively looking to shed its old-school, highway-first reputation. 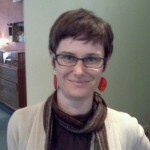 ODOT Active Transportation Policy Lead Margi Bradway is in charge of the “Strava Bicycle Data Project”. The north Portland resident, mother of two and active bicycle racer, says the idea came to her during a bike ride last summer. “It was during the Rapha lunch ride,” she shared with us on the phone yesterday. “Everyone was checking Strava and I started to wonder, ‘What if we used this data? '” Bradway then turned to Chris Distefano, a veteran of the bike industry who currently works in Rapha’s marketing department. He instantly loved the idea and connected Bradway with a manager at Strava. Bradway says since Strava had never given data to a public agency before, and purchasing data from a private company is also new to ODOT, it took a little while to figure out how to move forward and package the data in a way that felt comfortable for both parties. After several months of negotiations, a contract between ODOT and Strava was signed on September 23rd of last year and the first batch of data was delivered to ODOT on December 20th. So, why did ODOT want to work with Strava in the first place? The problem for many transportation agencies today is that, while bicycling is on the rise (for both transportation and recreation), there remains a major lack of data. This gap in data makes it much harder to justify bicycle investments, plan for future bicycle traffic growth, illustrate the benefits of bike infrastructure investments, and so on. It also makes non-auto use of roads very easy for agencies to overlook. And while ODOT and many cities do bike counts already, they only measure one location for a short period of time. Most importantly, current bicycle count methods don’t provide any context about how people actually ride. It’s this element of “bicycle travel behavior” that ODOT is most excited about. And while this dearth of data continues to plague the active transportation field, the proliferation of GPS devices and smartphones, and the popularity of apps like Strava and Portland-based Ride With GPS, are creating a huge and valuable user database. That being said, there is a major drawback to using Strava data: it’s not representative of all bicycle users. Not even close. Most Strava users tend to be serious riders on training rides. But as anyone can see on the Strava Global Heat Map, there’s still much to be learned by analyzing where Strava users ride. It’s important to remember that ODOT doesn’t manage many city streets so they’ll focus more on the arterials and rural roads they have jurisdiction over. And before you think ODOT is planning the future of bicycling in Oregon with this data, keep in mind that this is in its early stages. ODOT sees 2014 as a “research year” for the Strava partnership (which will wrap up by January 2015). In this first year, they’ll focus on three main tasks. The first task is to format the raw data into something ODOT staff can easily access and use in their daily workflow. To do this, they’ll rely on their GIS unit and a tool known as TransGIS. If you’re interested in using the data, you’ll be disappointed to hear that as per their contract with Strava, ODOT cannot share any raw data: They can only share it in the form of a report or a heat map. The data can help ODOT engineers understand how — and how many — people use the Oregon Coast Bike Route. ODOT has also already put Strava data to use in a highway management context. Crews wanted to count bicycle traffic on a bridge on Highway 101; but they realized their counters weren’t capturing all the traffic. This was because people on bikes choose a variety of ways to access the bridge. Looking at Strava data, ODOT was able to find a new location for the counters that captured more of the bicycling activity. The Strava data has also helped inform the conversation about where to install rumble strips on several highways. Other places the data could prove useful include: verifying the presence of bicycle use on rural roads; integration into travel demand models and forecasts; construction detour plans; maintenance scheduling, and so on. 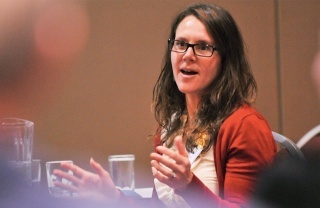 Concurrent with ODOT’s Strava Bicycle Data Project, the agency is also funding a new research project through the Oregon Transportation Research Education Consortium at PSU. That research, titled Crowdsourcing as a Data Collection Method for Bicycle Performance Measures, will be led by Dr. Miguel Figliozzi and will “test smartphone technology advances as they relate to gathering information on bike travel”. While ODOT is a pioneer in this field, other states have gotten wind of the project and plan to launch similar efforts. Tim Blagden, executive director of the Bike-Walk Alliance of New Hampshire, said they plan to launch their project this summer. “We intend to use the sample set to update statewide bicycle maps, to assist our discussions on rumble strip placement, to augment our bike counts, and more,” he wrote to us via email. — To learn more, download a PDF of the Purpose and Need for the Strava Bicycle Data Project. For a discussion about using Strava for bicycle planning, read this discussion thread on our recent post which includes comments from a Strava engineer. lol, where can i pick up my free swag for involuntarily participating in this study? I guess I should have read the EULA. I’ll settle for a Rapha jersey. I have never used Strava, but I’m under the impression that it’s favored by the folks who like to track how fast they go. Are we concerned that this will under-represent trips by people who ride for transportation? I addressed that in the story. And you’re right. 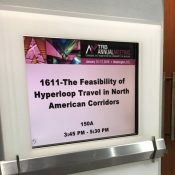 It is used mostly by competitive riders… But I have a hunch that as people find out it’s being used by agencies for planning purposes, more and more people will start tracking their transportation-oriented rides with it. Inconsiderate cyclists with bad manners screaming “Out of the way, Strava!” had soured me on ever using the app myself, but usage by DOT could make me reconsider. Having said that, I’m surprised DOT had to pay for access to the dataset because simple sharing seems like a win-win: DOT promotes usage among transportation cyclists, Strava gets more users. Honestly, did anyone every really yell, “Strava” at you? I pray that this has actually happened somewhere. That would be amazing. I would like to meet these people. What about folks without smart phones? Or the folks that can’t afford an android/apple phone? Is the app available in other languages? Nepalese? Somali? It’s more than just the divide between competitive riders and non-competitive that makes this dataset profoundly inadequate and inequitable. lol, are you going to yell out to people what their ethnicity and language are when you’re counting them, or are you just going to make educated guesses? I actually go out and talk with people, where they’re comfortable, with folks that can help us communicate and get at their needs and experiences. But, what I’m pointing out is that if you have an “opt-in” self reporting system, if the system isn’t completely barrier free for anyone to opt-in, and your advertising/outreach isn’t equitable, you’ll never have an equitable dataset. You’ll only have a data about the people that can access the system. In this case, there are barriers to who can use Strava and they happen to skew the data not just toward, but almost exclusively to the most privileged individuals in our social structure. The purpose of the data purchase isn’t a qualitative analysis of the diversity of cyclists in Oregon. The data has many uses, but one primary use will be a metric for the facility itself, rather than the race/ethnicity/gender/age/income of the rider. That is being addressed in other studies and datasets. It will answer questions like: Do cyclists actually stop at this intersection? Are cyclists actually using this facility we built? What are some “shortcuts” cyclists take? Your concern about equity is valid, but that’s a limitation of these data. It’s kind of obvious that it’s beyond the purview of the study they will conduct. This gets to the heart of the data problem: is a bike count really going to tell us what we need to know in order to design transportation systems that serve a range of Americans? The answer is no, because it’s ridiculous/impossible/offensive to learn about certain identities through visual profiling. Does this mean that all this info is irrelevant if it can’t be captured through a count? No, it means we need to develop different measures. I think most people actually buy GPS-equipped bike computers, if they are serious about using Strava. This is not a casual thing. Not just strong and fearless cyclist. Many people use it as a tool to track calories burned while cycling. Or people that can’t afford the gps equipment/smart phones that can run the app. By the time ODOT can do anything with this, smart phones of the iphone 3 generation will be effectively free. Isn’t the iphone 4 free (with $$ plan)? Smartphones don’t have to be expensive. I got a prepaid smartphone with data and calculate my costs (even with a new phone each year) to be under $20/mo. But what about people who cannot even afford food, let alone a bicycle?? I have Strava but rarely use it. Now that local transportation agencies might actually use the data to help them make informed decisions, I think I will use it for even my most mundane errand cruises if it helps them out. Is the contract only for last year’s data? Or is there a component to the contract where they will get updated info? I imagine more people would start using the app if it helped out with the cause of better cycling infrastructure. You’re probably right that Strava is favored by these folks. But anecdotally, my girlfriend and I both use Strava quite a bit because we were more interested in yearly miles biked and other numbers. We both ride upright style city bikes very slowly and aren’t in it to compete. Just interesting to see our data! so i don’t currently use strava. should i start? as a portland commuter(mostly), would this data be helpful? do you know if any other company(mapmyride, endomodo, etc.) is selling their data like this? go for it… there are so many segments that aren’t even remotely “racey”… you may find your commute has a bunch of little segments on it, and then you can see how you stack up. You may find that, like on a stretch of Clinton or something that you have the 50th best time out of 800 riders, which is pretty good, so you can feel good about that part of your commute, but you may find that on some other section you are like, 500th out of 600, so maybe you could dig a little deeper there and tighten up your commute. Or maybe your pace isn’t important to your self-validation. If this is going to be used in this way I’d love to see Strava offer a lightweight interface that didn’t challenge you to race others and simply offered individual stats. Given this development I may consider using the app again. I did for a short time, but its focus on turning my commute into a competition didn’t work for me. It does, you can take out everybody else but yourself and see all your times on a particular segment. Strava is what you make of it. There’s no forcing to be competitive unless you want it and seek it out. I assume this is meant ironically… surely no one is worried about “tightening up their commute,” right? no irony. I wouldn’t mind dropping 3-4 minutes off my average commute time. Does Strava have a “cargo bike compensator” feature? I keep getting smoked by Freds on the Springwater while riding my loaded Big Dummy. HA, I have joking asked the same question as I do use it while I’m commuting and taking my kids to school in the morning with either the burley or the Bakfiets. I do use strava for racing and training, but I also track all my commuting to see how I stack up month to month on milage and in some cases improving my commute times. Yes, it is geared toward a little friendly competition and if you want to you can use it for that. But the competitive goals are far from a requirement; If you want to you can easily use it to just track your rides casually. The interface is already designed to do this easily. We’re not all hellbent on speed. That doesn’t seem accurate to me. This is a very large sample size. Bradway’s example was that just 2.5% of the Hawthorne Bridge trips were by Strava users. If we tracked a representative sample of 2.5% of Hawthorne Bridge users, we would have very rich and useful data. I can’t imagine a reason to have more than that. To compare, think about political polling — Oregon has about two million voters, but we only need to poll about 600 to have reasonable precision about their opinions. You can increase that sample, sure, but you face diminishing returns in terms of statistical power. Incidentally, polling 2.5% of those voters would be 50,000 — totally impractical and unnecessary. The real problem (which Bradway also acknowledges) is that it is a biased sample. The risk is not that you develop findings that have a lack of precision due to the sample size. It is that you develop findings that are actually wrong, because the people in your sample aren’t representative. I think the anecdotal uses listed are more promising. The parking lot cut-through is a good example, as is the correct placement of the bike counter on Hwy 101. Tim Harford has a good article about the potential and limitations of this type of biased “big data” in the Financial Times. Boston’s Street Bump app is an example that I think applies here. In some ways, this bias may be really useful. Most of the Strava users I know ride tons of miles, for training, commuting, pleasure, etc. And through all those miles, they have gravitated towards the best routes through the city. Looking a the places they dodge will really reveal our worst facilities. As long as they look as this data with some good context, it will all be fine. And if they don’t, maybe we will get a bike lane for the length of Skyline!! I totally agree. Almost everyone I know that races or rides recreationally also rides for commuting or transportation. I think the line between recreational rider/racer and transportation rider is a VERY blurred one in Portland. I think the data from the frequent cyclists means a lot more. As an everyday rider that tries a new route on occasion but mostly rides where I know it’s best, I think my data must have been useful to show where people would *want* to ride, not just where they *happened* to ride. I half agree with you. It is a large sample size, as you said, but the sample is (most likely) not representative of the general cycling population, because it skews towards racers / people who are training seriously. In your polling example, it would be like polling 600 millionaires and expecting them to be representative of all 2 million Oregon voters. Trust me, i’m doing nothing but contributing doddering commuting speeds to this dataset. So will adding my commutes and road bike adventures to Strava now help ODOT? Or has ODOT paid $20k to Strava for one-time access to historical Fred-data? Yes. I’d say so. From what ODOT says, it’s very likely they’ll continue to purchase the data on an annual basis. Even though I am a Strava user, it would be nice for ODOT to access data from other providers as well such as Ride with GPS and Garmin, just to vary the sample variety of cyclist types. Also, Strava does offer a lot of features for free, but they do kind of push users into purchasing a paid premium subscription, if not done carefully this could look like an comarketing promotion. Also, from my bike racer perspective, I’m all for commuters and all other types of non-racer cyclists adding their data, but part of Strava’s GPS tracking includes fastest hill climb and TT “KoM”s for specific user created road/trail segments. And while I’m 100% ok if somebody on a cargo bike is faster than everyone else and sets the KoM for a segment, what does concern me is a flood of E-assist bike riders joining Strava (with the noble goal of their data improving cycling infrastructure) and taking segments from human-only powered cycles. I’m not sure if activities set by users as private gets included in the data sold to ODOT, but my plea to e-bike riders is to set activities as private and set up a bike profile specifically calling out the bike model, so Strava can build a filter at some point to remove them from segment results. I confess that I’m pretty amused by the idea of e-bikes ruining the Strava database for muscle-powered competition, but I don’t think you have too much to worry about. I commute on a MTB with slicks, and I’ve always been able to hang with e-bikes…don’t think a fit rider on a lightweight road bike has anything to fear. I think the issue would be with people who are already in shape using e-bikes to take KOMs. Or just getting on a motorcycle/car and driving slowly up Germantown/whatever other popular climb there is in PDX. There are definitely some incredibly suspicious things happening on some of the portland segments, in my opinion, but if you’re gonna leave something up to basically self-policing and personal morals, human natures dictates some people are gonna take advantage of it. Any user can “flag” a ride if it appears to be from a car or e-bike. It would be nice if Strava had an option to separate these out so that e-bike users could still log their rides for their own use, but omit them for any compiled statistics. It’s not just a small sample size, it’s a biased sample. If we’re interested in improving bicycle access for people at all income levels, relying on GPS data doesn’t seem like a very fair way to do that, and even if transpo planners are aware of the bias, I don’t trust their human nature to correct for it. Its actually a much larger sample size than they had previously when you compare it to things like road counters. Taking advantage of that much GPS data is probably the smartest, most forward thinking, 21st century thing ODOT has ever done. Not if it’s data that only represents the actions of people who can afford to use GPS on their bike rides. There are people who don’t own smartphones, but many more people have those than dedicated gps units. The heatmap doesn’t give me a breakdown of income and race. You’re making the same mistake that ODOT will make, assuming that it’s a representative sample without any evidence. The alternative has been street counting. How does that get income or race? Personally, I don’t think those figures matter. People who bike need good routes and infrastructure no matter their income or race. This is one of the big reasons to be excited about Bike Share. Bike Share GPS data will be a different subset of riders and behavior, so it makes a good complement to Strava etc. Since this article should draw a bike / map / geek crowd I’ll also take a second to remind you to edit your neighborhood on Google maps: https://www.google.com/mapmaker?hl=en Something as simple as making sure the map knows about Greenway 20mph zones and traffic diverters, can make a big difference to how cars are routed. Is there a good way to get bike directions from OpenStreetMap data? I’m still using Google Maps for this reason. Ridewithgps.com uses OSM data well. If you are using a Garmin GPS, there are ways to download OSM data to be routable on the unit. I use Google Maps to find the directions from home to places I need to go, not for planning recreational rides. I need something as good as Google Maps as at suggesting the best route to take by bike from point A to point B. Try Ridewithgps.com. No GPS is required, and it will route you on bike paths if you so choose. I tend to make a route in RWGPS while looking at the Strava heatmap for ideas. Strava has a routing feature, but it’s buggy and doesn’t do well if you want to use paths since the map they show isn’t exactly the same as the roads it tries to snap to. I don’t see how useful this info will be. Strava is used for the most part by cyclists on training rides. I don’t get the compression people commuting by bike really use it that much. It scares me that ODOT might take this data and use it to justify AGAINST doing something bike-friendly (“According to our data from Strava, no one bikes on Barbur, so we are not allocating our resources there…” Etc etc. Now it’s in ODOT’s interest to advertise this 3rd party tracking app to the cycling public so as to enrich their their investment. look at the heat map. this is not just training rides. I like Ride with GPS (http://ridewithgps.com/). Local company too. I’d never even heard of Strava before today. I’m a commuter, errand user, and sometimes touring cyclist. If the data were properly evaluated and proved useful, I think I might just start using it to help fill gaps in the planning process. Wait ’til Oregonlive commenters find out ODOT is buying bike data. Gasp! I will not willingly submit to yet more tracking of my personal habits even if it’s supposedly “anonymous”. Doubly especially for free for a commercial entity. I gladly physically count bikes every year and feel it is much more accurate for realistic transportation planning. It’s 2014. You are one in 7,046,000,000 and we can use the internet to easily share information about ourselves with others. Do you have a cellphone? Are you using a personal computer to type this message? You can fear the use of data, or make it useful for improving cycling. Your choice. On some level this purchase of data is an admission by ODOT that they can’t collect this quality of info due to cost, bureaucratic brainwashing, corporate lobbying or simple lack of ability. Other bike trip data collection methods that depend on a smartphone have similar data problems. I’ve looked at the data collected by the Association of Monterey Bay Area Governments (AMBAG) in California for example, which uses the Cycletracks app developed specifically for planning agencies. Affluent bike riders in the city of Santa Cruz CA and on the UCSC college campus are well represented. Immigrant farm workers who probably make up the vast majority of utilitarian bike trips in the south part of Santa Cruz County and northern Monterey County are completely invisible both to this app and to regional transportation planners. The result is wonderful bike facilities in the city of Santa Cruz, and crap facilities in “South County” and most of Monterey County. I love the idea of commuters taking up the Strava for data about usage. Imagine how fast that data would pile up over just the next year. Commuters may find it interesting to see others routes to help route plan; it worked for me in Amsterdam when I first arrived and on vacations when riding for exercise. I would imagine that the speed of the trip is actually sortable in the data too. A filter by speed would be fascinating (most popular route with a slower average speed might suggest commuter route). This could be helpful as often the tolerance for busier routes may vary between those competitive riders and commuters? I would think the Ride with GPS guys would be very helpful in addition to Strava. The subset of bike riders that the Strava data likely captures best would be of less value to a City than a DOT. So given that a lot of these training miles are on regional arterials and rural highways then it starts to make more sense that ODOT has entered into this relationship. It would be the same as a DOT tracking long haul trucker GPS data vs. the station wagon of a bike family (that spends more time parked in front of the house or driving 5 miles to the nearest TJs). 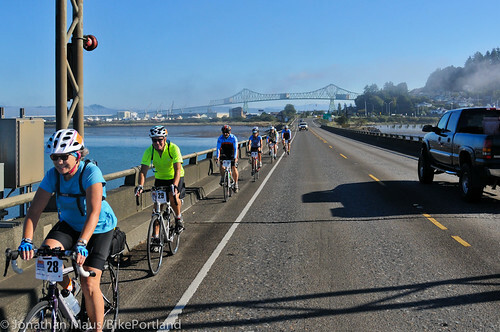 Perhaps ODOT and PSU should hand out Strava GPS enabled units to Oregon Coast bike tourists this summer. These units would be anonymously numbered and linked to a pre survey. Users would then drop them off at the border or mail them back…etc. you can just use a smartphone and a free app. Perhaps they should hand them out to the Portland’s homeless bike fleet. Riding from onramp to onramp? strava adoption by commuters would definitely improve the quality of the cat 6 field. We just bought data on 400,000 Oregon bicycle trips ridden in 2013. Stick THAT in your rankings, Leage of American Bicyclists. do these even work for carbon or aluminum bikes? They work inconsistently enough with even heavy steel frames that DOT’s have to show us “the special trick” to trip traffic lights by aligning our frames within a ±1“ target then leaning over the bicycle. This is not effective technology nor should we waste a single cent of taxpayer money on it ever again for bicycle related issues. I’ve read that induction loops mainly pick up the signal from your circular, metal rims. The wheel makes a nice current due to the shape, and 95% of rims are still metal (mainly aluminum). I usually get green lights this way. The fact that we have constant rehashes of the “how do I get the traffic light change?” topic and that DOTs have to paint “bicycle wheel target stripes” indicates that this technology is ill suited for an operating environment of automobiles, heavy trucks and tink bicycles mixed together. There is no cost effective way to tune an asphalt covered metal detector so that it only sees a bicycle within a 6′ bike lane while ignoring other larger bits of metal further away. Because of the difficulties in getting consistent and reliable results with loop detectors and their poor mechanical reliability camera based visual detection has been the path wise DOTs have forged. A fairly reliable low cost bike counter could use 2 cheap sub 2MP webcams: one aimed head on at a bike lane/path/MUP (ignoring camera visuals outside “the batter’s box”) and classify bike or ped based on speed but would use the 2nd camera @90° off axis for pattern recognition in profile. If you wanted to really cheap out you forgo a consistent data connection for a USB wifi dongle that tries to upload count data on any open wifi from cellphone wifi tethering APs. Most of the places where I have difficulty getting the green are intersections that use optical detectors (e.g., Millikan/Murray, Laurelwood/Nicol/Scholls Ferry) rather than induction loops, so I’m skeptical of the webcam approach. OTOH, most of the intersections with induction loops that give me trouble are along ODOT roads, so I’m not sure either approach will be very useful. I ride a heavy CrMo frame with the widest & heaviest rims made for 700s (Sun Rhyno Lite) and with all that metal I’ve been able to achieve ±3″ outside the normal bike detection stripe. Imagine if automobile counts required drivers to all croud in to 1 lane then drive right up next to the fog line: you’d NEVER get complete counts. My experience with camera detection systems has been mostly positive but I’m overweight, ride upright and have a +500 lumen light mounted on my helmet. I present a large unmistakable change in the camera’s FOV & the few recalcitrant cameras have been coerced by aiming the headlamp at them. Metal detector technology has its place in counting large metal but camera software can be upgraded to make even old low resolution cameras function better; making metal detector ground loops more accurate is very cost prohibitive. No kidding. I have problems with intersections (in Beaverton) that have both. In the absence of auto traffic going my way, I consistently have problems turning left from 153rd onto Cornell (has both camera and loop, although the loop is not marked), and turning left from the exit of Sunset Transit Center (also has both a loop and a camera). Other places that only have a camera, such as Aloclek crossing Cornell, or Burton crossing 143rd are even worse. I don’t think induction loops or cameras can be trusted to count bikes. Even in a bike lane, an induction loop is more likely to pick up right-turning cars than bikes. And when a camera can rarely even see a bike, how can it be expected to tell the difference between a bike and anything else? I’m just going to go out on a limb here and assume that Strava users are disproportionately male, affluent, educated, able-bodied, tech-savvy, and white compared the population as a whole. And when it comes to bicycling, skilled, strong, and fast. Anyone want to disagree? I’m sure commenters who are not those things will let me know, but I contend they are the exception, not the rule. Given that, and given the bicycle movement’s increasing awareness that we need to do MUCH better on equity and inclusion, I find it extremely problematic that we would decide that this dataset is acceptable as a proxy for where “people” go on bicycles. The apparent completeness of the maps further marginalizes what Dr. Adonia Lugo calls “invisible bicyclists,” such as poor people, people of color, people who bicycle on busy streets because they have no other option, undocumented immigrants, people without access to cell phones, children, old people, timid or unskilled cyclists…and so many more. As the basis for prioritizing transportation investments, therefore, this will entrench us even further in delivering resources to the privileged. 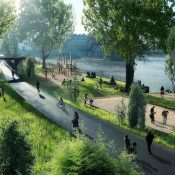 And as a basis for evaluating needs, it will obscure the needs and patterns of the edges of “8 to 80,” the poor, and people who have to bicycle on terrible infrastructure because the jobs and housing available to them give them no other option. We may say that we are “taking this data with a grain of salt,” but maps have a way of tricking our brains into assuming they are complete. And to imply that the right way to address the inadequacies of this dataset is to talk more people into purchasing and using technology will not solve the problem. I’ll dig up some data on a fairly normal stretch of road… the “Clinton 21st to 26th safe, darn it” segment. While I don’t disagree with your idea of the average Strava users (the data is not exactly a secret), the fact is most cyclist commuting further than the local grocer are likely disproportionately all things you mention (sure those numbers exists too). Further, when not wearing my affluent, educated, able-bodied, tech-savvy, WASP team kit, I don’t use my Garmin –trips for eggs and my 3 mile commute to work, etc. I totally agree with you, but the data can still be intriguing. Just incomplete. I hope the Strava data is only PART of a big data project. Didn’t SF do this a few years ago with an iphone app. Jessica, thanks for making these points. Seeing a demographic breakdown—how about by household income, ethnicity, and gender (cross reffed by number of dependent children) for Strava users in Portland would give us a better idea of who ODOT is planning to plan for. I’m looking at Strava’s heatmaps right now. Comparing the carfree circuit around the top of Mount Tabor with Airport Way, for instance, it would be reasonable to conclude that parks and off-road areas are important bicycling destinations whereas one of the region’s biggest employers and travel destinations is not. 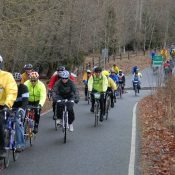 Recreational riding is vital and it’s great that ODOT is concerned with the well-being and ease of road riders. But since they are a transportation agency I hope Bradway and her colleagues are considering the emergency-level importance to our state’s economy of people being able to get to their jobs, schools, and homes without having to either spend thousands of dollars a month on a car or going without one and fearing for their lives, as they do at so many ODOT-managed places that most roadies have the privilege to steer well clear of. Mr. Garrett, tear down these walls! Totally agree with this sentiment, and Josh Berezin above articulates this as well. 3. Find ways, technologically or otherwise, to add data from “invisible cyclists” to the dataset. Just to be a nerd, I’ll point out that I didn’t coin the term “invisible rider,” I got it from Dan Koeppel’s 2005 article in Bicycling magazine. Ok on to substance! Yeah, the big issue is that yes, we are lacking data; but we are lacking different kinds of data. We need to know more about the who and the why of bicycling if we actually want to get more people riding. I can see the allure of these datasets for folks who work in analyzing these kinds of datasets. But what about what’s not captured? The equity argument is a good one and your point is well taken. However the strongest cyclist on the lightest bike is still ridiculously underpowered in a motor vehicle environment. It’s 500 Watts vs. 500 horsepower (SI conversion left as homework for the curious). A person on a bike acts much like another person on a bike. If I worked at ODOT, or PDOT, I would buy that data set too. The bias is known from the start and adjustment can be made for that. Who has actually decided this data is acceptable as a proxy for where people ride bicycles? ODOT seems to be aware of the data’s limitations of the data and focused on understanding what insights it can and cannot provide. I don’t disagree with you in general, but saying this data will be the basis for prioritizing investments or evaluating needs is a straw man. ODOT’s purpose and needs statement makes very clear that they are studying this as an added data source for a very limited scope of potential applications. Ok, so this is BikePORTLAND, so perhaps it shouldn’t surprise me that most of the commenters here can’t see past their own front door. But it’s the OREGON Department of Transportation that is purchasing this data. It may come as a shock, but people DO actually ride their bikes in places besides the City of Portland. And people DO actually ride their bikes for things other than transportation. And some of them ARE something other than rich, fit, spandex-clad white guys. The condition of the ODOT-owned roads outside of Portland where someone might ride their bike for pleasure is no-less deserving of ODOT’s attention than that of the condition of some commuter-heavy route in southeast Portland. 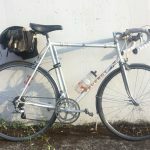 For example, I am often forced to ride across the Boone Bridge on I-5 south of Wilsonville because there is no other way to get across the Willamette River for many many miles. It’s not so bad Southbound, where there is a huge shoulder, but NORTHbound is a dance with death every time. Especially since they removed most of the shoulder to make way for an additional exit lane for Wilsonville. It would be GREAT if ODOT would take note of all the trips that cyclists are making over that bridge on a regular basis (and believe me, it’s a LOT of trips), and use it as an impetus to FINALLY fund the bike/ped bridge to the immediate west that they’ve been talking about forever. The Strava data could help demonstrate this need, and that is a Very Good Thing. Rather than always looking for a way to moan and find fault with what ODOT (or any other agency) is trying to do, why not be pleased that they are making a sincere effort to gather data from any and all means available to them. Good grief. Thanks and well said! I’m hoping this will help folks remember that ODOT also operates east of the Cascades. I would hope that any agency pioneering the use of Strava data in government planning would be taking a serious look at the potential disparate impact of relying on data with such severe selection bias. If the goal is to improve conditions for the willing-but-wary, the young and old, the poor as well as the rich, then there are serious shortcomings to self-reported data collected only from people who can afford GPS phones and good data plans, and who consider their cycling a competition to be recorded and analyzed. Where on Strava are average workers who happen to bike? Where are school kids? Retirees? Families out for a social ride? How well do the 17,700 riders on Strava represent the other 3.9 million people in Oregon? Early in this comment thread Jonathan suggested that once it is known that Strava is used for transportation research, more non-recreational-fast-high-end users will get on board. It is hard for me to imagine many people starting to use Strava in order to get their data into the dataset (nor that that demographic would be much different from today’s Strava users, anyway). I think it’s super that ODOT is doing this, and it’s also good that the demographic information is readily available so that ODOT and others can weight it appropriately (as some commentors have done above) and not assume that it is a representative sample. If we can generalize Strava users as recreational cyclists who tend towards longer, faster rides… won’t this data set be excluding problem places/intersections for those commuting, errand riding, or getting around in the city? If Bikeshare ever gets off the ground, the bikes should be equipped with something like this but not so that users can be spied upon. Heavy handed moderating day, JM? All data has limitations. More data is usually better than less data. Anyone with a smartphone can add to this data. The majority of Americans own smartphones (56% as of mid 2013: source Pew Center). And recreational, sport-fitness, serious, even (gasp) Lycra clad cyclists matter too. Some roads are ridden by far more of “those”, than by all the utility, commuting, casual, and subsistence cyclists put together. For example, Cornell over to the West Hills. Or 30 out to Sauve Is. Or Germantown. Etc. It is just as important that ODOT and others see that usage, as that they see other usage. As an avid road rider, I can see this being quite useful for vacation planning (where do riders who use Strava ride in the city I plan to visit?). However, I personally have never used Strava. I use MapMyRide as a trip planning tool to gauge mileage, elevation gain, etc. before heading out. Then I use personal monitoring equipment (Suunto GPS watch and pods, or iBike power meter) to *sometimes* track my numbers. I never share these data in a social media context. And I never use ANY of the above for commuting or trips to the corner market. So I would imagine that ODOT should only plan to use this data set for what it represents: the routes that the tiny subset of humans who CAN use Stava actually DO use it on. What ODOT would DO with the answer is a head scratcher (since I assume ODOT is tasked with designing infrastructure for the public at large). Perhaps the NSA has the most relevant, unbiased data set? Great points about how to get data from all walks of life, but it won’t happen. There just isn’t a method. What’s the saying? Perfect is the enemy of the good? We may have to 80% this project, and the more commuters who do have a smartphone the better the picture will be painted. I’m personally shocked at how good the map is at demonstrating the routes in and around town. I understand this is a post about ODOT use, thus the city routes may not be applicable to the discussion but the heat map really details what is used and what is needed in broad strokes. I was curious if this was all lycra racers why it does so well in the city, so I looked at another city I know the routes well. The heat map nails the infrastructure in Amsterdam. How can that be if it’s all racers???? I suspect it just isn’t. Here or there. There must be speed data that will confirm a lot of these recorded tracks are exactly who we need to watch to learn how to get around a place. What do you think? Look at cities that have great infrastructure…does the heatmap demonstrate it? What will our heatmap look like if we build infrastructure here? And…what the heck, are the Brits just gaga for Strava? Do the French thumb their nose at it in response?? As mentioned in the article. Setting up bike counts at various places, perhaps even with human beings (gasp!) with clipboards or cameras to record actual numbers and types of riders. This would have to be done on different days of the week to account for commuters and different seasons and times of year to account for fair weather riders and students. These wouldn’t have to be 24/7 X 365; but enough to ground truth or provide adjustments to the Strava data. This is a common practice in the world of science. Now I wish WashDOT would do anything so intelligent in my County. It would seem a usefully scientific research project would require a random representative sample and distributing phones pre-loaded with the app to volunteers who do not have a smartphone of their own. That could of course be pretty expensive but probably cheaper than building five feet of highway. What does it tell me? Well, not everything but… I notice that while activity does increase on the weekends, it’s not massively skewed that way, there is a lot of activity on weekdays. Infer from that what you will. Strava is logging over a million activities a week. I wonder if this changes anything? yeah… k-edge now makes beautiful CNCed garmin mounts for bakfiets. It seems like the important call to action here is that if you want your data included in future planning, post it to Strava, or whichever other logging sites that pop up that sell their data to city planners. I see a handful of comments from people that say they would upload their data if they knew it would ‘add their vote’ but this article was talking about 2013 data. Assume your data will be sold and used, and start logging today. Strava has a “privacy zone” feature that can cut off the quarter mile closest to your start/end if you don’t want your exact points to be saved. I use Strava on my commute and on lots of chill rides. I also have a fancy GPS computer. I often just use Strava because it sits silently in my pocket (jeans or jersey depending on the ride) and I just turn the pedals – with strava you don’t have the info in front of you all the time, I don’t know my speed, I just know I’m riding my bike. The data is as competetitive as you want it to be. also in reference to competetition – progress over time is personally interesting – not necessarily racing just a gauge of fitness or how smooth you’re riding. How far away is the bar? I’ll just turn on strava and cruise over. So should everyone go out and start biking on the dangerous streets that have no infrastructure? Would this influence the city? I’m now recording my commute and other utility rides on Strava. It is no harder than tapping the screen on your smartphone. Strava thanks you for donating your personal data to improve their bottom line. Just remember, you are not their customer and that your “private” data is only private until they have a security breach or get a subpoena. It’s like, super hard for me to tap the screen on my smartphone. In fact I can’t manage it at all, since I don’t have a smartphone. – get data from all kinds of cyclist. – cyclists are involved ! On a personal note please know that we do take our athletes privacy very seriously and the way that Strava Metro is built does just that. This is not raw data that is being provided back to planning groups but years of well thought out data structure. I know that by blending all of our efforts together we can make the globe a safer place to ride. “Our athletes” ? I didn’t know I was on the team. What’s the salary? Back to the “O” in ODOT, it was interesting to see where cyclists are NOT riding. (Disclaimer: I live in Wash Co. What you call recreation, I can also call a commute.) Not one single track on Cornelius Pass up to Skyline, in either direction. I haven’t ridden that road since the early 90s, myself, as it has gotten much more traffic over the years, and is the main truck route over the hill. It is also the EASIEST climb over the hill, and kind of sad that it isn’t safe to ride anymore. On top of that you can also view for any time the activites that are flagged as commutes. For example , 8am on Monday just commute activites vs Saturday at 8am just training activites for July vs October.